This post was previously published on my company blog at scenarioexpertis.wordpress.com. 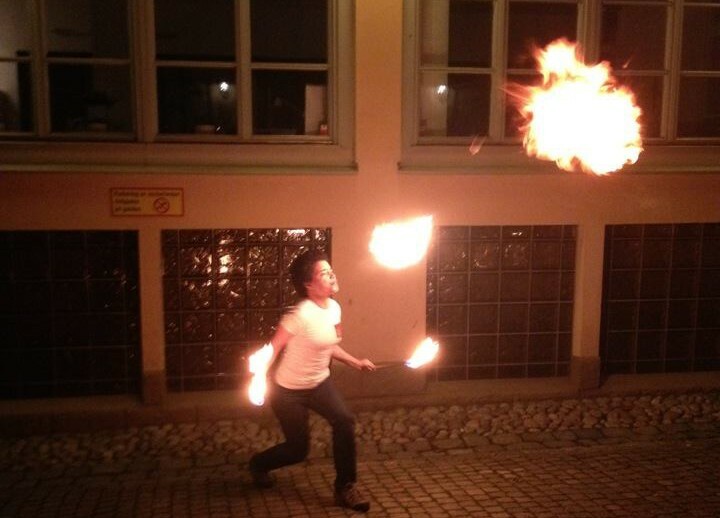 Whenever I perform, people approach me and ask to be taught how to firebreathe on the spot. Because this is the most dangerous part of the performance, I usually say “no, but I can teach you how to eat fire”. They tend to change their minds because they feel fire eating is more risky and they are concerned about burning their mouth. In reality, the risks of fire eating are few and easy to mitigate. When you put the burning wick in your mouth, it is enveloped in carbon dioxide and water vapor (from the air you exhale), which controls the fire. If you feel uncomfortable, you can simply take it out of your mouth! Breathing fire raises the stakes considerably. I have been lucky enough to avoid anything worse than singed eyebrows. Some fellow artists have been less lucky. One performer I know swallowed the fuel he was using because a member of the audience snuck up behind him and patted him on the back. He contracted chemical pneumonia within seconds. Luckily, the doctors were able to save his life, but his lung capacity was permanently reduced and he no longer performs. For this reason, fire performers go through a period of training before they learn to firebreathe. My experience as a fire eater has taught me three things about risk perception that I have found valuable in my professional life. When you practice fire eating, you get immediate feedback on your expectations. If you expect fire to burn you, you tense up, lose focus and get hurt. To be successful, you must expect that the fire is safe when handled correctly. When communicating risk as a security professional, you work preventively. Just as the audience member at a fire show, your client will have expectations regarding risk, your professional expertise and even you as a person. If you are doing your job right, however, your client will not have an opportunity to learn from experiential feedback. This means you must actively help your client set appropriate expectations as early in your relationship as possible. Ask them about their prior experience with the subject matter, what they wish to achieve and what they expect. You can then set expectations by outlining what you can and cannot do and how you may best help achieve your client’s goals. In doing so, it is always best to underpromise and overdeliver. When I do a fire performance and get enquiries from people who want to learn the art, I encourage them to visit a local fire artist gathering, or invite them to join me at one. That way, they can learn from skilled people, practice in a safe setting and become good at the art. As a security professional, you will often come across people who want to do things themselves. Some of them will be immediately helpful, while others will question your authority or competence. If you can get them on your side, however, they can become ambassadors and will serve to make your life easier. Talk to these people and find out what they want. Give them ownership of tasks and empower them to execute those tasks well. If they are concerned whether you will do a good job, get them involved in what you are doing. If they have trouble understanding some technology, take extra time to help them learn it, then encourage them to share that knowledge with their peers. Members of a fire performance audience will have very different perceptions of the risks associated with the performance. Some want to come close for a better look or to show their appreciation, without understanding the risks posed to the performer. Others will stand at the back because they are concerned something might catch on fire. I deal with my audiences by informing them early of what I need them to do for the best possible show. I discuss risks in terms of their experience of the performance, creating a common ground that they respect. As a security professional, one must encourage understanding and compliance with the technical risk assessment one has conducted. A significant step towards success involves reducing the discrepancies in risk perception by finding an objective common ground. Organizational goals make excellent common ground. Relate your assessment to this common ground and communicate it in terms of organizational goals. You also need to make good use of your empathetic skills to consider the perceptions of stakeholders with different views. They may well contribute some valuable insights.